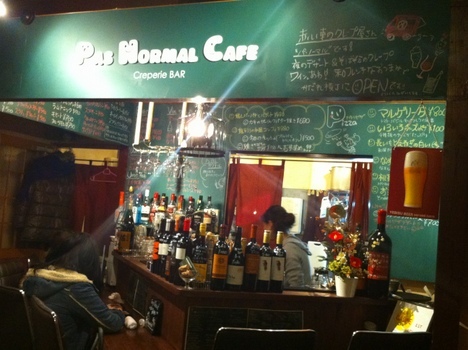 I’m so proud of writing this post, since the featured crepes are not yet really known even among Aomori locals!! 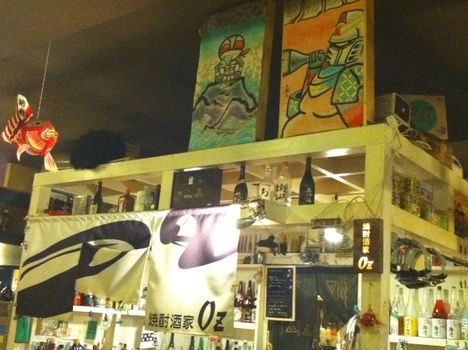 You will never find this crepe cafe & bar while strolling around the Hirosaki streets. 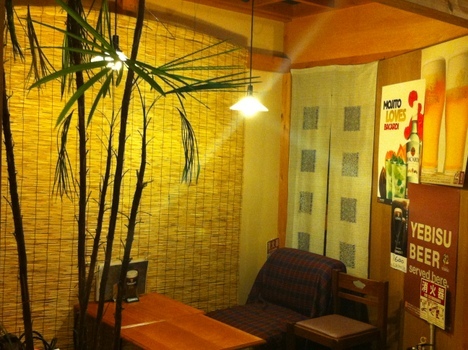 It is located in the building of “Kadare Yokocho”, the food alley in Hirosaki-City. 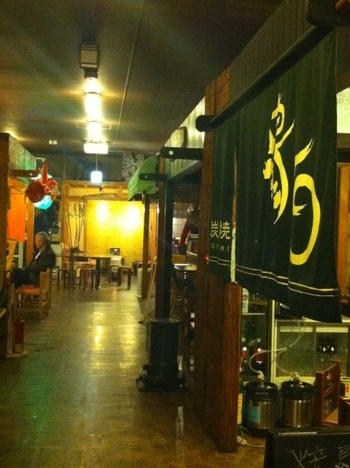 Various restaurants and bars such as Indian curry, Yakitori and Shochu Spirits share the 1st floor of the building. You can sit anywhere and can order from any restaurants and bars. It can be a nice place for a single traveller to chat with tipsy and friendly locals. I was so excited to come to this place. I’m a “galette(a savory crepe, usually made of buckwheat. 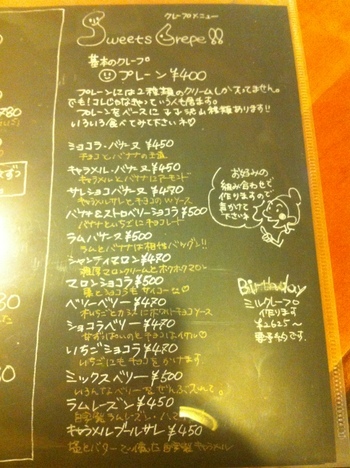 )” lover and heard this place serves delicious ones. But this time I passed it because I wanted to show you the following “special” dessert crepes. My colleague ordered Banana, Strawberry & Chocolate crepe and my order was Ram & Banana. After waiting about 20 minutes, my Ram & Banana was served! Looks so delicious! Wait, I see something on the left of the ring-shaped crepe. What is it??? Let’s turn the plate around to find out what it is! Hello panda…..s! 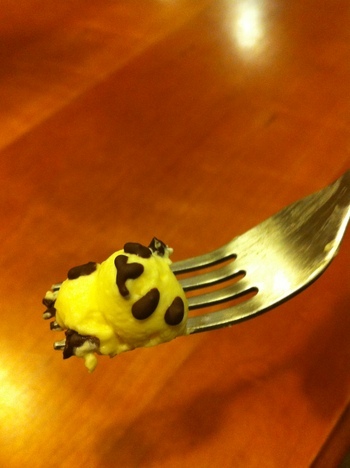 Wow- 2 pandas are made of just cream and chocolate. I think they are the most ephemeral & attractive art works which I will hesitate but definitely be eating up before long! Definitely cute! So are you ...hamsters or dogs? 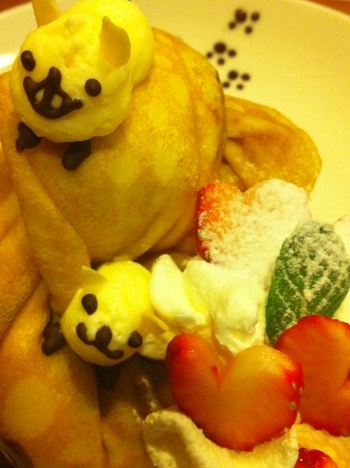 My colleague’s Banana, Strawberry & Chocolate crepe has 3 adorable but unidentified(oops) animals. Take a close look at this image. Did you notice the footsteps and the heart-shaped Strawberries? The crepes were cute, and undoubtedly delicious! It was nice meeting you panda, although it was such a short time…. I think this kind of food decoration is very “Japanese”, but you don’t really see it around Tokyo or other areas. 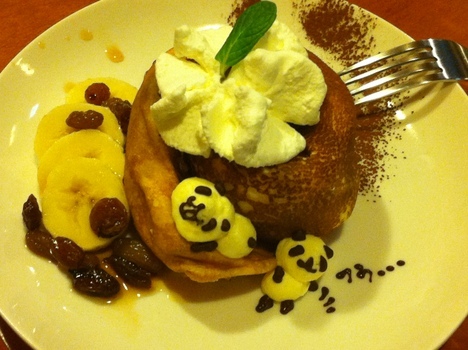 So if you ever visit Hirosaki, please don’t miss these cute & yummy crepes! PS) I liked the floor mats guiding the way to the restroom. Can't speak Japanese? No worries - at least you can find the restroom with no doubt! This entry was posted on February 13, 2012 at 4:33 pm and is filed under Uncategorized. You can follow any responses to this entry through the RSS 2.0 feed. Both comments and pings are currently closed. This is great!! I never knew this existed!! My husband works at a tattoo shop just around the corner from here!! I can’t wait to try it!! Konnichiwa Tori-san. Thank you for your comment and so glad to know someone like you visit the new places by reading our blog! I heard the topping animals vary depending on the cook’s feeling. Hope you enjoy the crepes soon! Ohhhhhh! Too lovely and cute to eat such animals on crepes!